Want to add a little pop of color to your space with a pillow? Here is the perfect solution! Pick any of these fabrics or if you have a certain color scheme that is not represented, let me know and I will pull fabrics for you to choose from. 4) Pick a size (16x16, 18x18, 20x20, or lumbar size (10x16) or if you have a specific size you need, just let me know! I will then get back to you on the price (They start at $20). The price will just be for the case, not the filler, but if you would like me to send you the filler as well, just let me know. 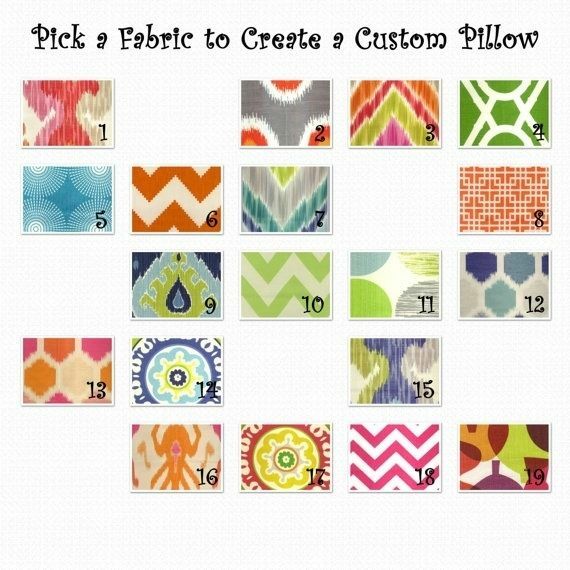 Again, these are made smaller then the size you specify so the pillow form will fill it out.